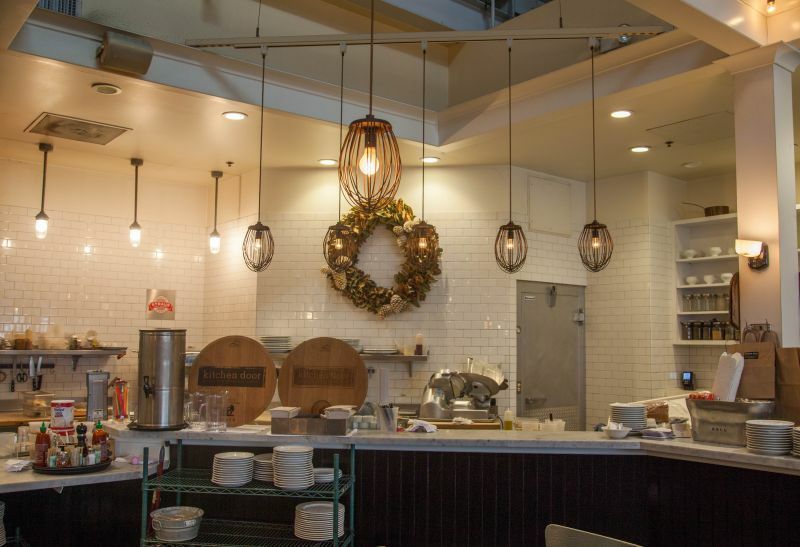 The Kitchen Door is a restaurant with its entrance inside Oxbow Market. We have seen it on our frequent visits to this culinary cornucopia and oft commented that we should try it. 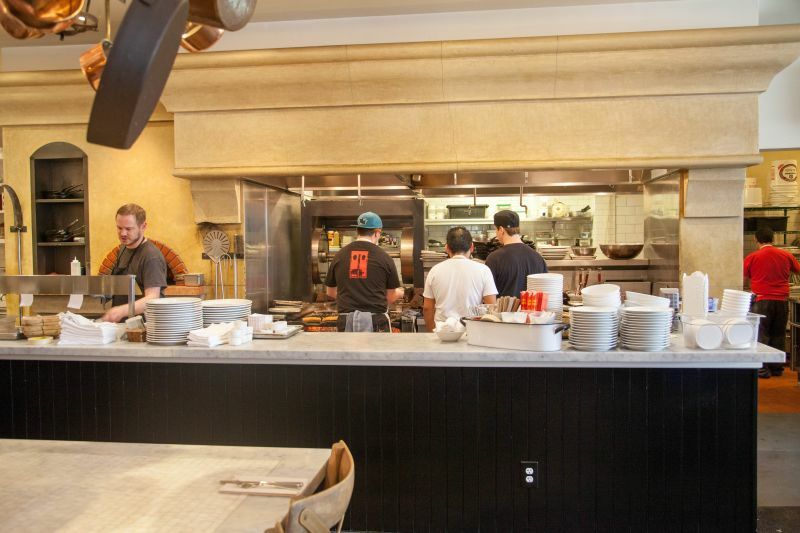 On a recent visit to Oxbow, our first choice for lunch was full, so we finally made the choice to try The Kitchen Door. 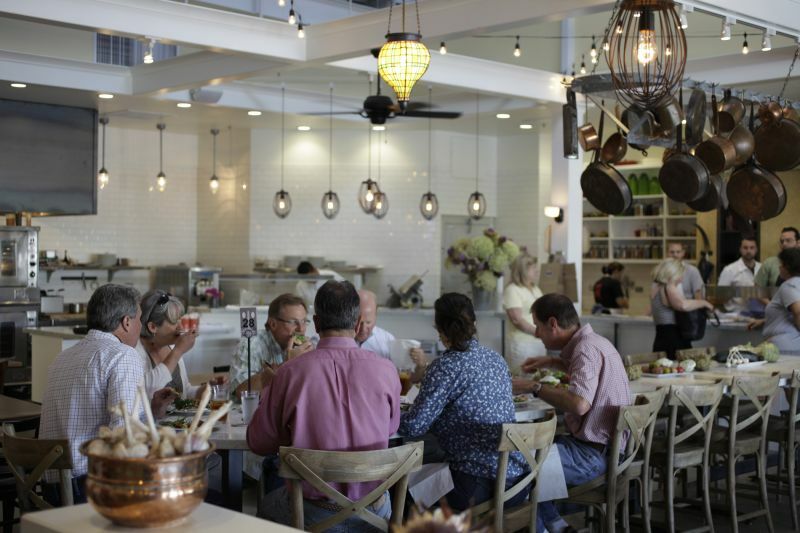 The restaurant is dominated by an open kitchen and large plate glass windows. The floor and walls lack any soft furnishings, so the chatter of customers resonates, but not so loudly to make conversation impossible. California Girl comments: I really liked the decor of the space. The basic colors were black and white with grounding tones of wood and pops of color given by multi-colored plates on display. We were seated at a large shared table which reminded me of a kitchen island in the middle of the restaurant. It had a huge white marble top on it, and everyone sat on stools around it. The lighting around was the retro look that is so popular these days. The entire picture together was quite pretty. California Girl comments: As the kitchen was open to the restaurant you could hear the chefs calling out the orders to one another. It was interesting watching them all work so fast and with such precision. However, it did add to the noise level of the restaurant and I am not sure I would want to go there for a romantic meal. I ordered mushroom soup to start. I rarely order soup, but it was a cold, wet day, and the idea appealed. This proved to be an excellent diversion from routine. The soup was rich, creamy, and perfectly seasoned. The flavour dominated by the mushrooms. The croutons remained crisp on the top, even as the bottom soaked up juices from the soup. My one criticism was that they provided a dessert spoon and not a soup spoon; which, were I scoring the dish, would make it a 9.9 rather than a 10. California Girl comments: The soup was incredible. 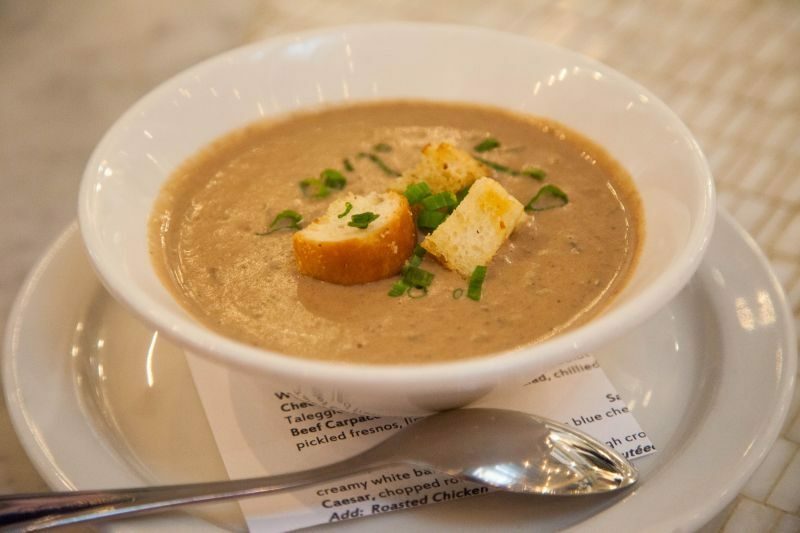 It is one of the best cream of mushroom soup examples I have ever eaten. I helped myself to two large spoonfuls. It had lovely cream and mushroom flavors with just a hint of wine in there for depth. Delicious! My choice of wine was a blend from Judds Hill. We have often driven past this winery which sits close to Luna at the Southern end of Silverado Trail. 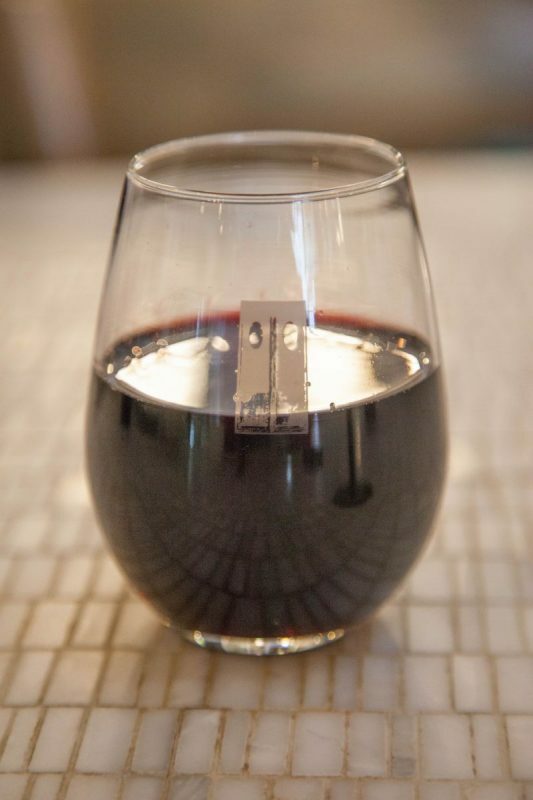 The wine was a non-traditional mix of Cabernet Sauvignon, Merlot, Petite Sirah, Syrah and Old Vine Zinfandel. Called “Barrel Select Blend”, the list of wines makes it less like a selection and more like pouring something from every barrel they had. The result was a challenging mix of softness with an intense acidity; not a bad wine, but I am not sure whether I really liked it. The one thing I can say with certainty: it was neither bland nor forgettable. 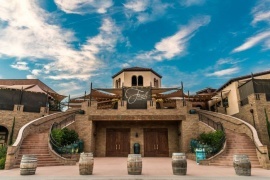 California Girl comments: I ordered a glass of the 2014 Franciscan Estate Cabernet Sauvignon. It was soft, smooth and easy to drink. There were blackberries and plums on the palate with a whiff of spices. It was medium weight, and low in tannins. I felt it was a drinkable wine, though not outstanding. It was a good choice with the burger I ordered. It wasn’t too big or bold. I choose a second appetizer for my next course; the wood-fired chicken wings. 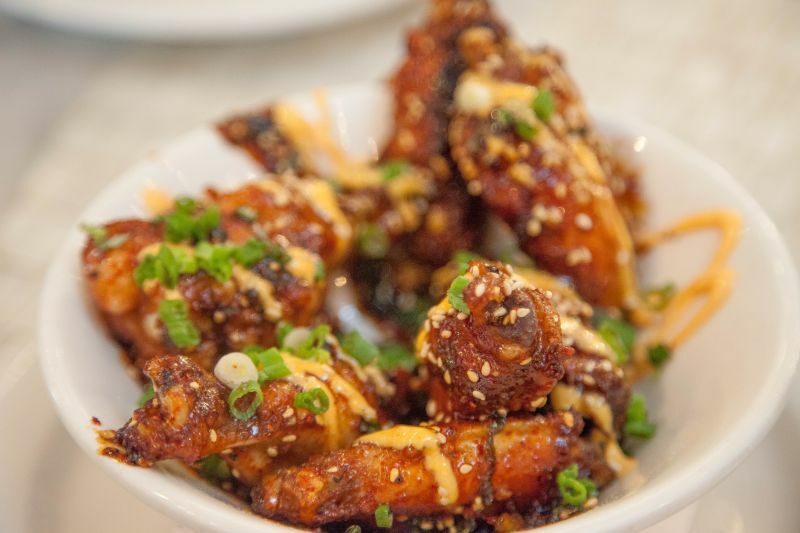 The wings were slathered in a teriyaki glazed, sprinkled with sesame seeds, and drizzled with a spicy mayo. This was not a dish that encouraged cultured consumption; I soon had sauce across my fingers and face. The spice from both the glaze and mayo was lively, but not overly hot; it was, however, too intense for the wine, which I had to put aside until I had finished the course. California Girl Comments: I have to say I really didn’t care for the flavor of The Brit’s chicken wings. To me, it was like they were soaked in soy sauce flavor without any sweetness. It just tasted salty and unappealing to me. The bits of char on the wings didn’t do anything to help the flavor. I would not order this dish for myself on our next visit. They failed the “overcooking my chicken” test. 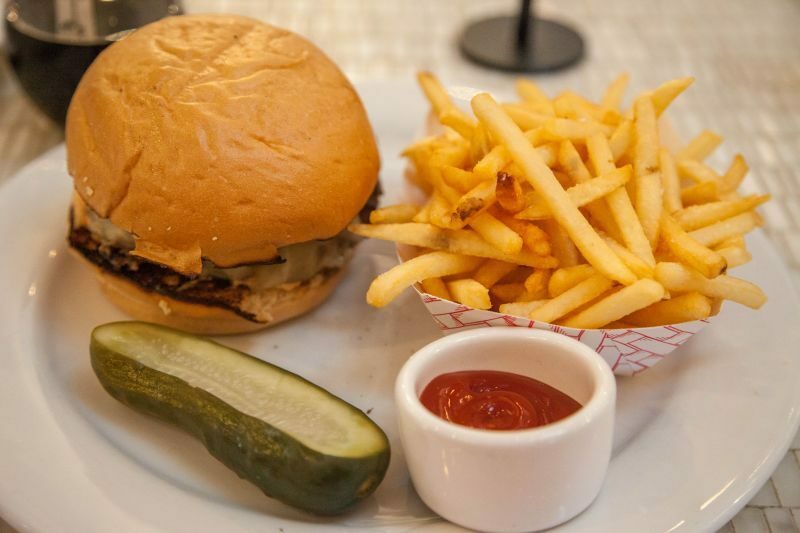 California Girl Comments: I ordered the Kobe Beef Burger with cheese and onions that had been sauteed in wine. It was a delicious burger. My burger was cooked perfectly and was really juicy. It was both nicely seasoned, and plentiful and I was very happy with my food. I would definitely order that burger again. The fries that came with it were slim string fries. They were crisp and well seasoned. The only thing is that I don’t care for fries that are this skinny as they get cold so quickly. The food and wine were good and out of the ordinary. Our server was on point and clearly knew both the wine and food well enough to offer helpful advice. 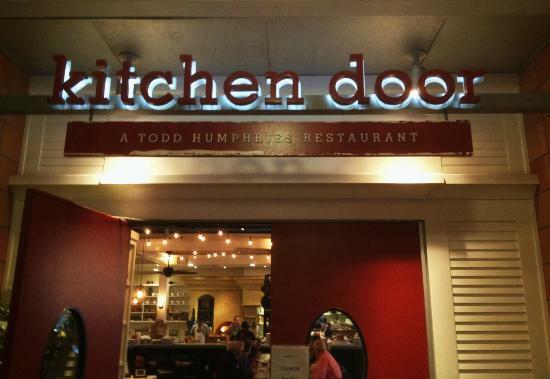 I would prefer softer furnishings, but that reservation would not prevent me revisiting or recommending Kitchen Door. California Girl comments: I thought the service and the food were generally good and I liked the atmosphere for a casual lunch. I would happily go back. Next time I will order the pizza as it looked really great.